Here at Jackbox games, we try to be unpredictable. Sure, every entry in our critically-acclaimed series of party game collections has included the words “The Jackbox Party Pack,” but each one has a completely different number at the end. So, when we decided to make a new one this year, we rolled our twenty-sided die as usual. It landed on two, but we did that one already. So, after nine more re-rolls, we are excited to announce The Jackbox Party Pack 4, coming to major digital marketplaces this Fall! And, as you might have guessed from that logo up there, the first game in the pack is Fibbage 3. If you’ve played the prequels, you’ll know the joy of fooling your friends with your clever lies, while hunting for the real answers to ridiculous trivia questions. And if you haven’t, there’s plenty of time! The new one won’t be out for months! It’ll look something like this, but it’s a work-in-progress so don’t hold us to it! Just back off, okay?!?! Especially eagle-eyed fans might notice that there are 10 choices in that screenshot, rather than the traditional max of nine. That’s because this time around, the audience gets to join the fun by voting on their own decoy lies, and guessing the truth along with the players. Now, fooling the audience can really boost your score, so make sure to get as many gullible people as possible to join! There’s a lot more to say about Fibbage 3 and JPP4, but that’s all we can reveal right now. Stay tuned to the blog, and follow us on Twitter and Twitch for more info! I like how the sample question is about San Francisco restaurants, and the room code is another famous SF restaurant (SPQR). Wow! I can’t wait for this! Over saturating a market in this bubble of an industry is a very bad thing. You’re setting yourself up for failure in that even if many wanted it, they’re still breaking into games on the third pack. Either one hub for all games or you really need to space out these releases. NO WAY. I bought 4 copies of all three party packs(for various systems). Somewhat for convenience; but mainly to support this team. Bring on JBPP4! I’ll buy 4 more! (not all at once though). This is all fine and good, but I still want to see the same kinds of deals for Xbox One that the PS4 community gets. I’ve been waiting quite a while on Jackbox Party Pack 2, and it just hasn’t happened…yet pretty sure PS4 owners have gotten a discount. Where’s the love for Xbox One owners? Yes…and I believe I took advantage of the sale. But for Party Pack 2 on XB1, there hasn’t been the sales like PS4 owners have been getting. I have to agree, I bought all 3 and I hate going back and forth between games. If you offered a code of the previous games and main a single hub that you’d add games to going forward, I’d love that. Cookie Masterson Is The Host again? How high will the number count go until you guys switch to “Jackbox Party Pack 20XX”? My family and I have spent countless hours howling and having an excellent time with your current games. One of our personal favorites is “Earwax” in the 2nd Party Pack, I’d love to see a sequel to it! 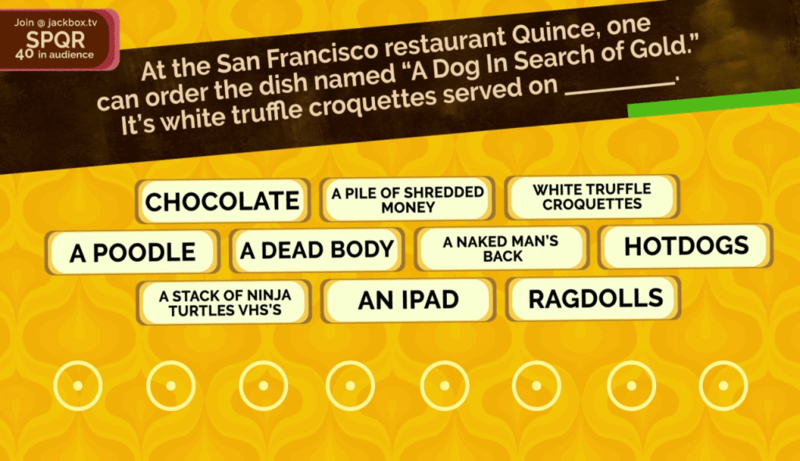 And of course there’s nothing like Quiplash and Fibbage. Thanks for being amazing and delighting our evenings with quality entertainment!! <3 can't wait for this release! Really loved Party Pack 1 (got the retail PS4 version) and Party Pack 3 (got it on Switch… loved that I was able to play it in the pub with some mates last Thursday) – but seriously miss my favorite Party Pack 1 game (Fibbage). Speaking of retail… will there ever be a retail Jackbox bundle containing all the Party Pack releases? With the subheader: Contains 4 games containing 5 games. For those who aren’t good at math, that’s a lot of games!. I hope this is planned for Nintendo Switch, to me that is the ideal version for the sheer portability factor! I already have JPP3 on Steam, and am even considering double-dipping if it ever goes on sale so that I can bring it to family get togethers. Why release a new game when a full price DLC would work better for fans of your game? Having all the party games in one “box” would be extremely better. Exactly. Keep it all under 1 “Jackbox” title with DLC additions. It is very annoying to switch between Jackbox games during a party when not all the included games in a single box are enjoyable for the audience you have. Kills the party buzz. I mean, I’m going to buy these games every year either way, but I’ve been really hoping for some more classic You Don’t Know Jack. YESSSSSS!!!!!!!!!!!! Screw the haters, this is GREAT news. We play Jackbox at all of our parties, and we’re constantly looking forward to these. SO SO EXCITED!!! Why are these games never online multiplayer, my xbox party would love to play these together. Whew, I’m looking forward to this. I’m keepin’ my eye out for some certain games getting well deserved sequels, heheh. There is a thing called live streaming.. Please make another YDKJ but with more players! I can’t get enough of your crazy shenanigans! THIS! Such a bummer with the lack of players on PC. Online sure would be nice. It wouldn’t take much effort for simple p2p. Please make this upcoming release available on steamos. Wow, I can’t wait for this! On the subject of Fibbage 3, I’ve been trying to write down every question I can find. So, if you know the answer…. Exactly how many questions are in Fibbage XL and Fibbage 2? I would really appreciate an answer. Thank you! Still waiting on Word Spud 2………. Please Translate it to german subtitles or at best to german voice actors, we love it vut not everybodys english is good and so some people cant play it here. WOOOOOO! Super super excited. We adore all of your releases and are so glad y’all are getting the recognition and sales you deserve. I keep throwing my money at the screen but it doesn’t seem to be taking it. I’m buying this game, sight unseen, as you lot have delivered many hours of laughter. Also, please do another Guesspionage, and include an option to select “close-ish” where the guess is 5% either side of the guess. It’s our go-to warm-up round during lunch break at work. When Will You Release The Game In Fall? Put You don’t know jack 2017 in it please. Does major marketplaces include switch?Pack 3 sold extremely well from what I can tell so I hope there are plans for pack 4 and even 1 and 2.With the switch it’s so easy to get a great party going anywhere with this game even at work during a 15 minute break! Please bring JBPP4 to the Nintendo Switch! I bought JBPP3 on that console and it’s perfect fit for the hybrid. I already have six or seven discrete executables for Jacbkox Games in my Steam library – instead of coming out with new redundant Party Packs every few months, have you considered switching to a model with a single free “Jackbox Launcher,” and then include each game/update/etc as paid DLC to add to the launcher. This would also simplify adding new content packs to each game. Then, instead of having Fibbage/XL/2/2XL/etc, we could just have one “Fibbage” with all the content and latest features. Y’know what would be even cooler than yet another Fibbage? Another YDKJ. I love the game, and my friends too, but not all of them can play because they don´t understand english. Or… maybe, give more options to do custom episodes for the game so people could translate them into their own language for their parties?